On the snowy road to the Earth Kingdom for the holidays, Imogen and the bakers are ambushed by Horace, villainous leader of the Badlands Army. They’re forced to detour to an idyllic, rural village, bedecked in lights, garlands and winter cheer . . . all a little too perfect to believe. At least that’s so for Imogen, who’s seeing burned out buildings and mysterious memorials that no one else seems to notice. Erin, tell us about your series. Is this book a standalone, or do readers need to read the series in order? I’d definitely recommend reading the books in order. 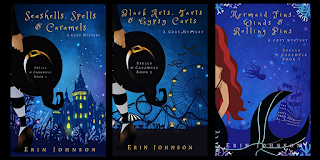 The series is the Spells & Caramels series, following Imogen as she learns to wield her magic, while working in a palace bakery. There are some big reveals in this fourth book that will have much more impact if you’ve followed the story from the beginning. Home is where I grew up, Tempe, Arizona. I would buy myself a massage . . . or some more travel. I can’t wait to go back to Japan. What’s the dumbest purchase you’ve ever made? Right out of college my sister and I wrote a screenplay together and decided we were going to go to Hollywood with it. To made ourselves official we bought a retainer for an entertainment lawyer in Los Angeles to draw up our contracts. Haha! We never had any contracts, and got our money back, but looking back it was a pretty silly purchase. We were jumping the gun just a bit. Anything repetitive where I don’t get to be creative. A college job in data entry comes to mind. I do! I teach Pilates and I run an amateur zoo. Just kidding, but I do have three rescue dogs and they’re a handful. Taking naps in the afternoon with my Labrador (she’s a great cuddler). So, this is weird . . . I’m laughing as I write this. Pandora was inspired by a contestant on Project Runway named Kentaro. My friend showed me this clip of him playing Tim Gunn a piano piece he’d written himself that was inspired by a dead cat he found in the street, and the whole interaction was so hilariously awkward I knew I had to work something like it into the book. So I wrote Pandora to be a funny mix of musically talented socialite and adorable weirdo, inspired by Kentaro. I have lots that I love, but right now, I’ll say J.K. Rowling, Jane Austen, and Sarah J. Maas. 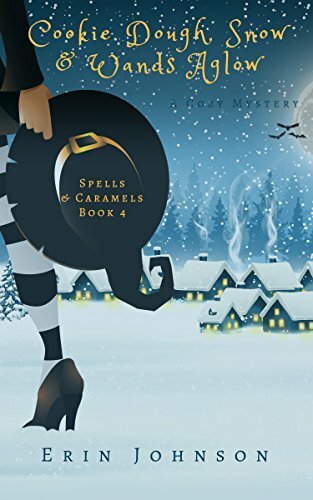 I am reading an ebook of H.Y.Hanna’s Witch Chocolate Fudge and loving it—the characters and the setting are so fun to get immersed in. I think the hardest thing I’ve had to write lately was a toast for my friend’s wedding. It’s tough to strike the right chord of sentimental, funny, genuine and most importantly, appropriate. I think it went over well though—he’s still talking to me! I love the Suzzallo library at the University of Washington in Seattle. I wandered the campus with some friends on a trip there a couple of years ago, and a student asked if we’d like to tour the “Harry Potter” library. Um, yes. It lived up to its nickname. 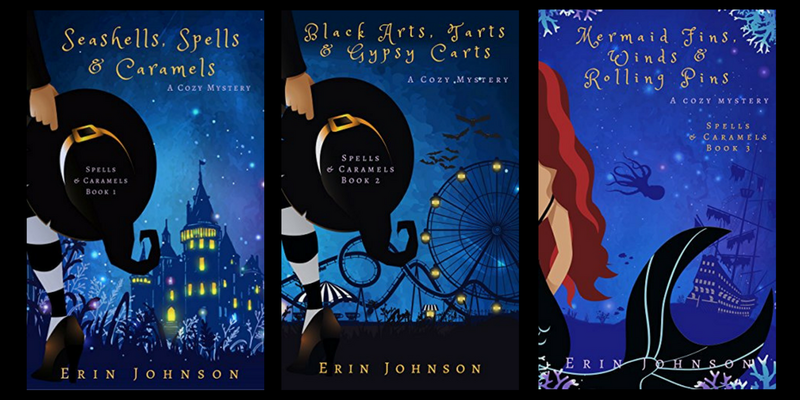 A native of Tempe, Arizona, Erin spends her time crafting mysterious, magical, romance-filled stories that'll hopefully make you laugh. 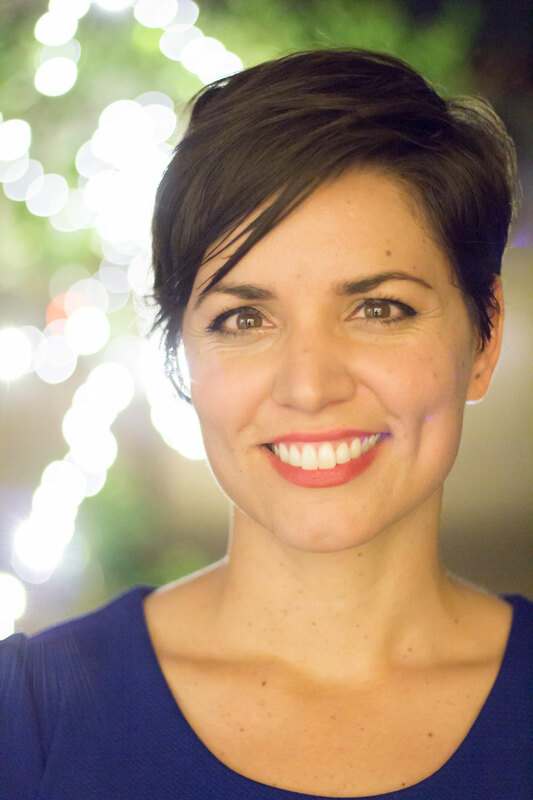 In between, she's traveling, napping with her dogs, eating with her friends and family, and teaching Pilates (to allow her to eat more).